The Bobolink Coffee comes from one of the highest coffee producing regions in Brazil. With altitudes ranging from 1000-1400 meters, this coffee is all family farmed. Instead of treating coffee as a homogenous product we believe in focusing on smaller lots and harvesting unique flavors. We are a network of farmers working together and exchanging information in order to innovate, evolve, and produce some of the most special coffees in the world. Our philosophy is to achieve the highest quality out of each bean while taking into account social and environmental responsibility. The varieties used to produce this coffee are among the highest quality producing Arabica beans available: Yellow and Red Bourbon, Yellow and Red Catuai, and Red Mundo Novo. Our agricultural methods aim to produce in harmony with nature. This means both utilizing nature to create a healthy balance of shade and rich soil, and respecting the habitats of animals and keeping springs and waterways clean. The coffee is all handpicked selectively at the ripest stage of the fruit to ensure flavor, sweetness, and a clean cup! 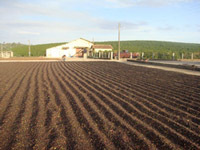 The coffee is then dried naturally, either in raised beds or on cement patios. Our advantage in being family farms is that we can and do watch over our coffee at all times. Upon harvest and drying we take the beans through an extensive cupping process in order to eliminate any lots that don t meet quality standards. Because coffee is such a sensitive plant to sunlight, rain, and temperature and because we work with various small lots we cannot assure that the coffee will always taste the same but hopefully improve as we continue to evolve! What you should find in a bobolink coffee is a clean and stable cup that has rich chocolate and a hint of nuts. At a lighter roast the complexity of the flavors are more vivid with a higher acidity and hints of citrus. As you roast the coffee darker, the sugars will caramelize creating a rich chocolate flavor. My suggestions for this coffee are to brew it as an espresso or as a drip. The stability and sweetness of this coffee makes for a rich taste that lingers smoothly in the aftertaste. Our aim is to reach a relationship with our consumer and tell the story of how this coffee was produced. We are constantly working on ways to improve the quality of the cup and the quality of life!